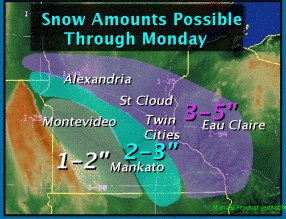 Yet another snow "event" was expected to hit the Twin Cities Sunday night into Monday. As of Saturday night, here were a few forecasts we gathered. Here's a briefing we did with Tom Novak on Sunday morning. Please let us know if you specific questions that we can add to figure video sessions. WCCO: "2-5 or 3-6 across metro"
Thanks for the update Bill,since I didn't catch all of this evenings news,I know it may be minor but TWC app on my phone has 2-4 inches and weatherunderground is at 3",also I know Novak hasn't put out an official snow totals yet but on his facebook he says "the stage is set for significant snowfall across the Upper Midwest",but I'm sure you already knew that......good night all see you in the morning and look forward to what changes lie ahead,I'm thinking for sure a WWA will be posted,maybe a WSW if they are unsure if they will go with an advisory or warning for the duration of the upcoming storm! Thanks, Big Daddy. I find it hard to keep up with TWC forecasts. Between video, text forecasts on the site, and the mobile app, it seems to be a moving target. WeatherNation had 3" this morning in the forecast from Todd Nelson and 2.6 in the metro on their "snowcast" machine. Going with 4-7" less sw more ne. I may be to conservative east of I 35E. In other words White Bear Lake through Maplewood and Woodbury. Novak hit it on the head when he talked about how a large storm doesn't always mean high snow totals. When all is said and done, the wind factor of this will be the bigger hazard in this storm. Snow totals won't be all too bad but we know it doesn't take all that much snow to create big issues with strong winds. It's not going to snow for all that long, but when it does it will come down pretty heavy and those accumulations will be over a short time frame. Overall everyone has generally the same snow total forecasts, so hopefully this one will end up panning out as forecast. No precip type issues, with everything falling as snow. Be safe driving everyone. It wouldn't surprise me to see some sections of interstates within the blizzard warning closed down tomorrow due to white out conditions. Of course, these white out conditions are highly dependent on them seeing a couple inches of snow. The story with this storm is the wind. Everything west/SW of the loop is in a blizzard warning. It only takes a couple inches of snow to cause whiteout conditions when the winds are steady at 30-40 mph. Things are going to get nasty on Monday, even though snow totals will probably stay in the 2-4 inch range. Bill/Novak, thanks for the storm update video this morning. I like hearing the details instead of just the final forecast. Please look on the right, look under "other impacts", and click on "Blizzard Criteria"
Looks like everyone's predictions are in the same ballpark which is not a big surprise with this storm. I think MSP will see right around 4", but expect most of the metro to fall in the 3-6" range. Sometimes it's storms like this where I miss living in rural areas during the winter. It will be a good old fashioned ground blizzard to the west of the metro. C'mon. I still have hope and faith and dancing going on!! Bring 8 inches and wind and we could have some real fun around here!! Bring it!! I suddenly like the RPM model. Bring it, RTM! Just put the kids on the bus @7:15am..........2 inches so far in Golden Valley,and snowing heavily! Bill/Novak, I appreciate you guys taking the time to make those videos. Good stuff. So is this winters final hurrah?,can I put the shovel and snowblower away for good? Bill love the videos,maybe ask Novak my above questions for a future video. Thanks! @Mark P. If you listen to Paul Huttner over at MPR he pretty much believes this is it for significant snowfall,if you call today significant. I believe,I'm no met.........but the way this winter has gone it won't surprise me to get a snowstorm late in March or even when the Twins are suppose to take the field. The snow has been beautiful this morning! The quarter to half dollar sized flakes are always fun to watch. I see that far northern Minnesota is expecting around 9 inches today. I wish the storm had taken the earlier advertised much more southerly path so we could watch those big snowflakes fall all day and pile up here in the TC. February was very good to us snow/winter fans, and this has been the best March that I can remember in a long time! I have to admit as storms go this was pretty lame,only 2" here in Robbinsdale and the snow has stopped and the sun is trying to bust thru,I know its suppose to get windy,but really!a winter storm warning is not warranted here,maybe if the 40-50mph winds were blowing when the snow was falling.Lame-o,4 inches of snow the past week when it was hyped/forecasted/advertised/talked about to be much more! Spring is here. Just got done clearing the driveway and the sun finished the job even as cold as it is. Overall pretty decent winter but it is time to start looking forward to the severe storm season. Great site you have here keep it going! Otsego MN. What happened to the strong winds that were to precede the band of snow?The winter storm warning has disappeared,the blizzard warning has been trimmed considerably,ANOTHER bad placement of headlines,and the slump continues for the NWS,its like watching an all-star in a hitting slump,I sure hope they get this slump figured out before severe season gets here,hate for them to place watches/warnings I places where it doesn't storm and a tornado hits where there was no warning at all. I have to agree with some of the sentiments already about this storm,I expected more snow(1.5 in Hudson),more wind,bad travel,I just expected it to be worse is all and I'm pleasantly surprise it wasn't ,even my commute times were reasonable,March snow is a breeze,if its not a foot of snow its not bad at all.I guess I was expecting more is all,I mean heck the sun is out,I thought we were suppose to get snow showers most of the day with wicked winds,I was expecting a cloudy bitter winters day with snow falling,that's not happening right now! Yes, the past 5 days or so have not been as eventful for you, but pose that question to those who live in Stillwater and/or Forest Lake. Many areas of the NE metro have received 10"+ of snow since last Wednesday. So, to say that the NWS has blown it is a bit harsh. I don't believe you understand weather and or forecasting and it shows. It is extremely difficult, if not impossible, to forecast such sharp gradients in precipitation coverage. Please keep this in mind while you are mindlessly bashing people who are trying their best. Kudos. We have an additional foot of snow here since wednesday. Probably thanks to that four inch burst, and being at the higher end of the totals for all of these storms in the metro. Although some of it has melted, that is what we have. This shows how close the center of the metro was from big snows. Its not a big flop, just pinpointing issues. All done! Is this our last 1 for the year? Our contracts end at the end of March so this may be it for those who "work" the snow. We just got in and MAN is it windy. Got a couple of those 40+mph gust in my face. I'm wind burned from being out in it all day. Maybe some more snow tonight? Hope not, I'm pooped! When I got home from work Monday night and looked at the 12z models all of them looked rather benign except for the GFS that brought a whooper of a snow storm to SW MN. No other model on the Planet showed it, and the 18z GFS brought a mega sized whooper into the same area. I almost posted a snowfall total of the GFS for entertainment purposes only, as I was 98% sure the 19/0z model would certainly loose it. But low and behold it still has it, now I have to stay up to see if any other model shows it. One other point if interest, it's showing it for next Sunday into Monday morning. It's seems to me that the pattern over the last 6 weeks or so has been for slow Monday morning commutes. Ok the Gem is in and it does show a drastic change from the 18/12z run to the 19/0z run. It now has a strong surface low in se Missouri while the GFS is slightly north at hour 132/138. The GFS tracks the low further north and keeps the Gulf wide open bringing strong gulf moisture into the system from the southeast wrapping into the low dropping good snow's into MN. The Gem keeps it south, but I believe that is a function of severe convective feedback shown by that model. If you look at it, there is extreme precip around all quadrants of the surface low except the southern part, that is generally considered unrealistic and a sign of convective feedback, which would not allow the surface low to track further north. Therefore I think the GEM is to far south. I wonder what the Euro will show? I originally thought all of the precip would stay south of us for the next 10 days, now I'm not so sure. Are they off their rocker?.....does this potential exist?...are these totals what your seeing off the GFS Randy? I personally think they are off their rockers and the GFS is too far north with the system. The storm in general needs to be watched because if it does indeed form and move across the south it could spell severe trouble for folks down there. Will need to see several more model runs though before I completely buy into it. I just think with the AO going as negative as forecast that the overall storm track will stay to our south for the time being. NWS now has snow and/or rain wording from Saturday thru Monday,be it its only 20%,but it shows there is a chance. Sunday: 70% chance of snow,up to 4"
Is something brewing again for this weekend? OK,off to work,should be interesting to see what others think of a possibility of a early spring snowstorm! Model mayhem....GFS and FIM love a weekend storm while GEM, UKMET and ECMWF don't. Its seems that in the 5 - 7 day range the Euro models have been superior to the home grown models. Remember how the GFS wanted to bing a storm late this week, while the ECMWF was consistent on a westerly flow across the Southern US with cold continuing for the Upper Midwest. It was clearly correct. The ECMWF, I feel, is better at sniffing out longer range patterns. We shall see. Interesting with this last storm, after all the warnings posted in North Dakota and NW MN, that Fargo (and most of ND, actually) got less snow than MSP. Crazy. Nothing even approaching normal temps thru 3/28 according to yr.no. I don't have to commute next Monday - let it snow! Novak says no big storms on the horizon thru the weekend! Dave Dahl says light snow moves in late Friday,slightier heavier snow over the weekend,but not major. Wunderground has backed off on heavy snow,but still has high chances with up to 4". Love me some global warming right about now! Anyone rooting for the GFS to pan out this weekend,they still have snow furthest north into Southern MN(including the metro. Paul Douglas sidekick,Tood Nelson(Star Tribune)says "snow potential increasing for Sunday. Weatherundergroud has backed off a ton for this weekend,just mention 2" now. 6z GFS has maybe a dusting/coating in the metro with the accumulating snows of the system no further than Des Moines-Quad Cities-Madison. The bulk of it is further south than that, more along a line from KC to Indianapolis. We'll see if it comes back, but NWS discussion had Euro waaay south around Tx, GFS as northern outlier, and everything else in the middle. Seems the GFS is now trending towards the others. C'mon GFS! Bring it. One last hurrah? I loved it when the GFS run (earlier) had 2 feet for southern MN. Come north-- the last one did. It was going to nail Msp and then almost ended up in Canada. Seems ok for this one to move from Missouri to Iowa. Bring it. Dancing already! Do you own any property or commute anywhere? Was just thinking back to last year when some here were gloating over the warm weather and lack of snow. Feels great to see some payback this year, even though I'd have liked to avoided the January thaw. This nice longer winter will make the other seasons way more pleasant.... then hopefully back on track for more normal Minnesota winters again. Loving this! We're all still out riding our winter bikes on the first day of spring. Even the heavy snow year of 2010-11 our trails were closed by now for spring thaw. At this rate we'll still be open into next week. All the models are starting to converge on the southern solution, keeping most of the big accumulations well south of the area. Overall models look pretty quiet locally with a few outside chances of some light snow here and there but nothing major in the near term. The long term does have some bigger systems showing up to our south, but those are too far out to pay much attention to at the moment. I agree with Ian's quick look at the weather a bit after 9pm on 03/20...no above normal temps looking out the next two weeks. Lots of snow on the ground. Biggest worry would be a quick jump into the 40's and 50s combined with a rain event. Could cause some nasty flooding. Is it just me or are the official temperatures for the metro really misleading? I live in the Lakeville area and our temperatures are typically much colder than what is reported on television. For example, we were two degrees below zero yesterday morning, but the airport (official temperature) was 7 above. This morning we were at 7 above, but the airport recorded a low of only 14 degrees. I have only lived here for a handful of years. Perhaps this area of the metro is so much colder than the rest of the metro? It's pretty well accepted that Lakeville is colder than MSP. Huttner talks about it all the time. The metro temp is at the airport. Lots of concrete and asphalt runways and is a sort of central location to MPLS / ST. Paul. It holds heat. Same as Mpls. Even 15 mins. away from the airport in Minnetonka we are sometimes 5 degrees colder than the airport or Mpls. temps. "Heat Island effect". Hey guys, decided to throw a little video update together on the storm going to our south, and my opinion on when things may warm up. I had to go through it quickly to avoid the video being too long, and so I didn't have to wait an hour for it to render. We'll have to keep an eye on things down the stretch. Like someone mentioned before if things warm too quickly and the snow melts too rapidly it will just end up running off into the rivers rather than into the soil. The Red River Valley is already forecast to have bad flooding so it's something to monitor. Vid link is below. Weekend snowstorm has shifted north,NWS going with snow likely in MN river valley for 1-2 inches,even the metro has 30% chance of snow for late Sat./Sunday,so it has lifted north any chance it moves further north to include the metro? @Mark P.,anything is possible TWC now has 60% chance of snow showers for Sunday! Its no secret I'm a snowlover and love snow and winter,but I have to admit I'm a little disappointed,with all this cold air around,cold enough for snow it could have been a really snowy March,I know we got 13 inches thus far this month but it could have been so much more if the storm track was in our favor.Don't get me wrong I'm enjoying this March so much more then the blast furnace March of last year,its nice to enjoy winter recreation on March 23rd............the warm air will eventually get here but the longer it takes is okay in my book. Here's a research/trivia question for you all.......what's the last day that our temperature was above average for that day? Yeah depending on where you live you either saw much above average snowfall for the month, or you saw maybe close to normal. Here in Eau Claire we cracked our top ten for snowiest March's on record. Let's really hope for a slow melt because there is quite a bit of liquid available that will do the ground moisture a lot of good if most of it can soak in to the soil. As for your trivia, the last day MSP saw above norm for a high temp was on March 8th (high of 39, norm is 37). March 14th MSP was right at the norm for the day (high of 40, norm is 40). Thanks Duane for the research......I knew its been awhile,2 weeks since we have been above average,this for sure ensures a colder then average March which would make it two months in a row of below normal temps,so that leads me to another trivia question.....when was the last time we had 2 consective months below average? NWS also mentions that the first week of April looks to be 5-7 degrees below average,sounds good to me that the warmer air is staying at bay,they also mention a stronger inverted trough for Friday/Sat with a chance of significant snow and another stronger spring storm passing south of MN a week from tommorrow,do these features look to effect us in MSP with anymore snow,or is the snow over for us and I can summerize my snowblower? Big daddy, I echo your sentiments. We could have had a blockbuster snowy March if the storm tracks had been tweaked ever so slightly. Just look at today with the big storm traveling west to east across the center of the country. Kansas City is forecasted to receive 6-9 inches of snow. I am enjoying the cold and the deep snowpack here. I am still ice skating on a homemade rink here at the end of March! The snow is still at the level of the benches on my neighbor's picnic table, which is sitting level away from any fences, walls, etc. I'm heading out tomorrow morning to do some cross country skiing. The ice on the lakes is still at least 2 feet thick, most areas are closer to 2.5 feet thick. This winter sure has been backloaded with February and March answering the call. I wish we had had these conditions in December and January as well. Oh well, it's almost April so it's time for the temperatures to gradually begin warming. However, I do recall a very snowy and cold April 2002. I believe the Twin Cities picked up around 20 inches of snow that month. I lived in Bloomington at that time and I distinctly recall going cross country skiing several nights after work in April! I must admit that I am getting a little anxious for the baseball season to start. As much as I love snow and winter, there comes a time when I begin to long for green grass, sunny skies and 72 degrees. Here's hoping this summer isn't hot and humid and that next winter is a "real" winter Thanksgiving through March!!! Well done Duane. Watch out TC mets. Your jobs are in jeapordy. Anyone watch that USA World Cup qualifier last night played in Colorado(just northwest of Denver)?the game was played in a snowstorm,there was inches of snow on the field while the game was being played,they even switched to a purplish colored ball so they could see it........it was unreal how heavy the snow was coming down,poor Costa Rica I'm sure that was the first time any of them played soccer in the snow.I think I watched the game for as much to watch the snow fall as to see who would actually win the game. Nah. Those guys have seen snow before. Of the Costa Rica roster, 3 play their club ball in Norway, 1 in Sweden, 1 in Denmark, 1 in England, and 3 in the United States. Most of these guys have played in cold and snow before. Those hoping for warmer temps will only have to wait a couple more days. While they will still be a bit below normal, temperatures in the 40s should feel pretty nice. Not much going on in the near term, but long term is looking active on the models. Rain and snow events are both showing up, but the rain event is really one to watch at the time. Frozen ground and still a good snow pack is really the worst thing when it comes to rain and that is exactly what we have. If the 12z GFS solution ends up panning out, that would spell big trouble for area rivers since none of it would be able to soak in. There is still a lot of time left before we get to that timeframe but it is certainly something to monitor. Snow lovers, there are still a couple systems also in that timeframe that could drop accumulating snow but again those are a ways off. Keep in mind, just like before winter begins, we are in the transition time and the models always struggle with the transition. Expect even wilder swings in the model runs over the coming weeks. A cold snap one run may end up being replaced by a big warm up on the next one.